"So tell me this," I said to Eli 12.8. "This is a statue of Athena, but the real Athena--does she have body odor? Can a goddess have B.O.? "Oh, Dad," said Eli, shaking his head and reluctantly smiling. He is twelve and already world-weary in the ways of his father. Eli is having a tough day. An hour ago, his team lost in the finals of the Nashville tournament 5-2. There was one goal he could have stopped, but there was nothing he could do about the rest. The other team (from Carolina) was just better. It was a tough way to end the weekend. It was also raining, and cold. We needed a distraction. 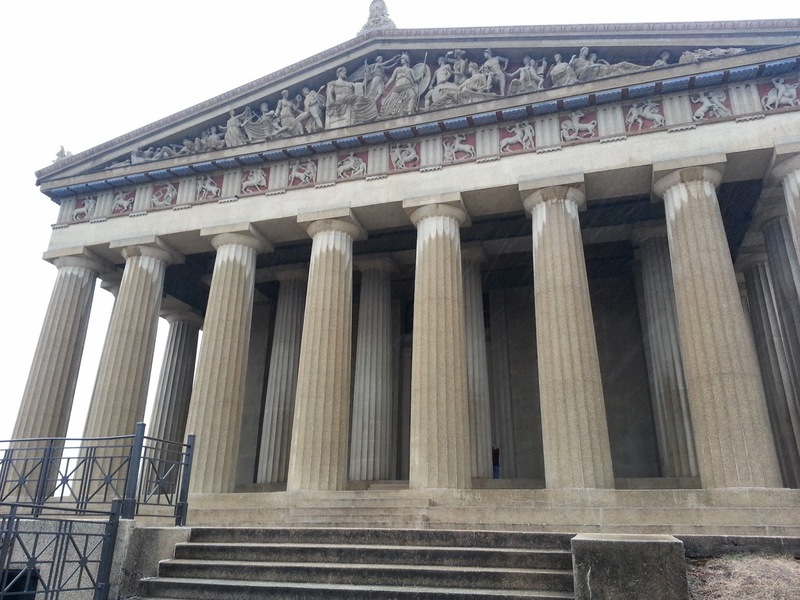 The replica Parthenon (full-sized, incredibly) was just across the street from the rink, so we decided to go. 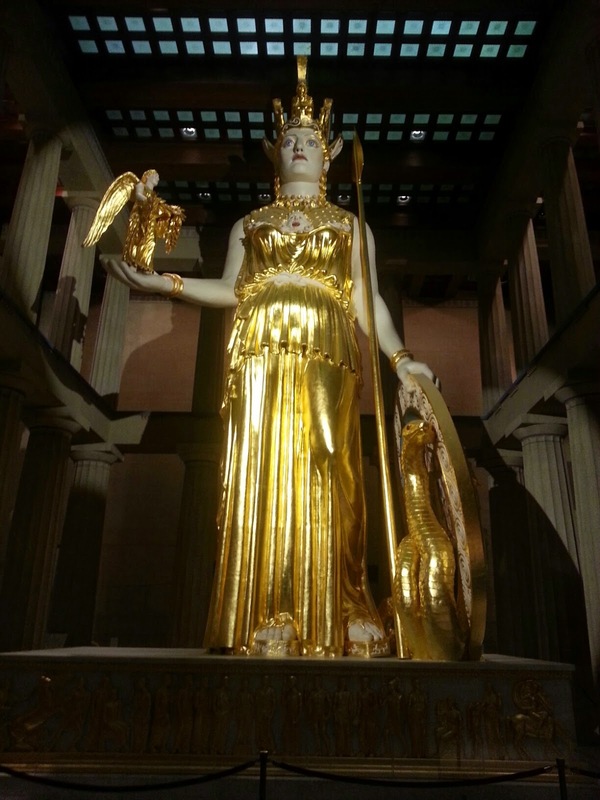 That statue of Athena, by the way, is full-sized as well: 41' 10", for those of you keeping score at home. "I mean, I know the statue is just a physical manifestation of something beyond our comprehension," I said. "I think that's right," Eli said. We walked in silence for a few seconds. "Still, though, what about her toenails?" I asked. "Trim or no trim?" He laughed. "Look, I know you didn't get the ending you wanted for the tournament," I said. "Sometimes you don't get to write the endings. But what a story! We'll be talking about this trip for years." "We will, won't we?" he said. We ate pizza near the rink, and there was a Krispy Kreme across the street, so Eli decided he wanted a doughnut for dessert. Yes, this was the same kid who threw up all day three days before. Gloria got a chocolate-glazed doughnut, had two bites, and put it back in the bag. "I'm done," she said. I love chocolate-glazed doughnuts, but I almost never have them anymore (fat, etc.--even worse than a glazed doughnut). What the hell, though--we'd been through a lot in the last few days, and she'd only taken a couple of bites. I could pinch off the ends of that doughnut and have half a doughnut left. This was very, very unusual for me--I absolutely NEVER eat after someone, even Gloria (weird food thing). Like I said, though, it had been a long few days. I started to reach my hand forward, just as Gloria said "Just so I'm not tempted," and she smashed the bag with her hand. I groaned. "I was actually going to eat that," I said. "What? You never do that!" she said. "I didn't even ask because you always say 'no'." "I know," I said, "but this time, I was just about to ask if I could have the rest." I picked up the bag and looked at Eli, who was laughing. "In this dramatic recreation, I will play the role of your mother," I said. "Just so I'm not tempted to eat the rest of this doughnut," I said, as I put the bag on the floor, then started stomping on it repeatedly. Eli spit water out of his mouth, he was laughing so hard. I stomped for a good while, then picked up the bag, which now held a doughnut the thickness of a thin-crust pizza. "Does anyone, um, want the rest?"